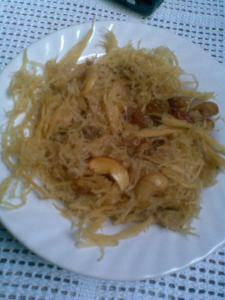 First, the thickness of the vermicelli is not uniform and it seems to be flattened and rounded irregularly. Secondly, it is not made in a bunch of straight thin vermicelli, it is made into a circular bunch of vermicelli which stays together if you lift the disc like fenni in your hands. So fenni is different from seviyan. It has been a long time since I had had these. Fenni is available in Banaras and old Delhi (and many old cities of India) during the holy month of Ramadan and I think it is a Muslim specialty. But interestingly, it is valued on the day of hartalika teej for Hindu married women too. You will find very interesting amalgamation of the two cultures in old cities of India, where Hindus and Muslims have lived together for centuries and adopted each others food and culture as if their own. This is thee way I understand it, would like to believe it to be true. This year when teej was approaching I was talking to Arvind how husbands cook meals for their wives when they break the fast next day. Teasing him. I know he can't make anything in the kitchen except coffee. He makes malai wali coffee adding a lot of cream and claims to be a great coffee maker :-) and he certainly is. Since he could not cook and I was successful in teasing him, he brought a lot of fenni for me. Some people know how to compensate the lack of cooking skill. But to be honest I almost fainted seeing the amount of fenni he brought. A kilo of fenni is just too much. There were 4 packs of 250 gms each. Now I had to find good ways of using the fenni as just fenni soaked in milk is a bit boring if you ask me. And such a rare commodity needs to be treated well too. 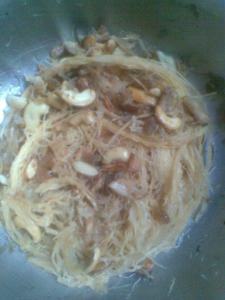 I tried making sookhi sewaiyyan with it, just the way I had tasted in my Muslim friend's homes. 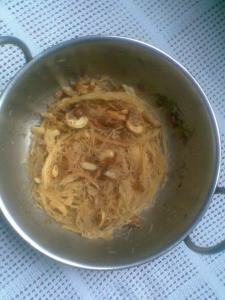 In fact fenni is served with hot milk on the eve of teej which is called sargi which a gift from the MIL to the bahu. Sargi includes some material gifts along with sweets and savories for the bahu from the saas. I think these traditions must have been made to create bonhomie between the saas-bahu (MIL-SIL) and the trick still works. I have fond memories of my MIL arranging these for me during the first few years. 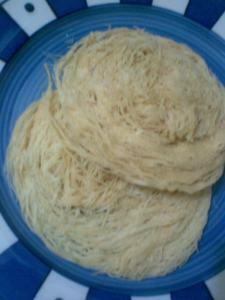 The sewaiyyan I made with the fenni looked something like this. 12 strands of saffron mixed with a tbsp of warm milk. Mix sugar with 120 ml water in a pan and boil for about 5-6 minutes to make a thick sugar syrup (one thread consistency). Keep mixing the strands of the fenni with the help of a fork. Sprinkle the saffron milk, mix and serve hot, warm or cold. Next time you see fenni or sewaiyyan in any old markets, don't stop yourself from buying it. These are much much better than the pastries and cakes and a little indulgence of such desi desserts always quenches the parched soul. More because one wonders how such intricate things must have evolved. Fenni or feni is an evolved version of sewaiyyan. Isn't it? 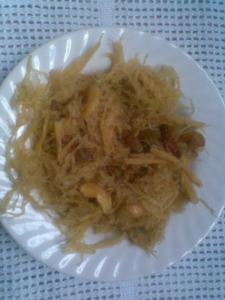 yummy seviyan dear.........we just eat it with warm milk...nice touch with nuts......sure will try. Luring a Bong with sweets? Now I am going to eat that every day and if I put on weight, you shall explain that to my boss ( I mean my wife). This one is new to me sangeeta, looks different from the regular seviyan, we dont get it here though. Yummy looking seviyan...new to me.would love to try it..nice presentation..thanks for sharing. Thank you so much for posting this long lost recipe. 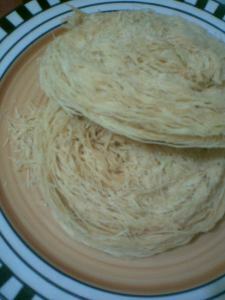 I had also tasted few precious mouthfuls of this seviyan during Id goodies sent over by ours neighbors some 20 years ago. I'm so happy to see you post it. I cannot wait to try it. I'm really eager to try this recipe , however I'm hesitant due to the poor quality of feni available here. there is just one brand of feni in the market and it has always given a foul rancid oil taste and smelll.I've had to throw way 2-3 boxes of this feni and never bought it again. maybe I can try this recipe with super thin vermicilli and hope for the best.